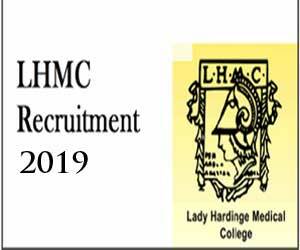 New Delhi: The Lady Hardinge Medical College (LHMC), New Delhi has released 81 Vacancies for two different posts. The first is the faculty post for Assistant Professor and the second post is a non-faculty post for Junior Resident (Non-PG). The recruitment process for filling 7 vacancies for the Assistant Professor in the teaching sub-cadre (Faculty) will be done through a walk in interview. The recruitment process to fill up 74 vacancies for the posts of Non-PG Junior Resident in various departments, including the reserved PWD’S vacancies will be done through written examination. 1. The vacancies can increase or decrease. The numbers of vacant posts indicated above are provisional and subject to the change without any notice. 2. Out of the 74 vacancies, 03 current vacancies are reserved for persons who suffer from not less than 40% of relevant disabilities 10L, OA (nonsurgical)}. For Dental Department, OL and HH are eligible. In case of non-availability of suitable person with disabilities the carried forward reservation and backlog vacancies against 46 seats shall be filled by persons other than a person with disabilities. Reservation: All Reservations will be considered in the above posts strictly in accordance with prescribed norms/rules as prescribed by Govt. of India. The selection of MBBS Non-PG Junior Residents will be made through MCQ type written test followed by counselling and for BDS Non-PG Junior Resident, MCQ type written test base. The candidate must bring the filled in application form as per the format given in the annexure (paste one recent passport size photograph and attach two stapled photograph self-attested). 6. The tenure of Non-PG Junior Resident is for one year including any service rendered as Non-PG Junior Resident earlier on ad-hoc/regular basis in any Institution (Initial appointment on selection will for 6 months extendable to another 6 months on recommendation of concerned HoD). 7. Candidate must bring the following original certificates with copies (self-attested) at the time of registration for verification, failing which candidates shall NOT be permitted for registration. a. Certificate in support of age (10th Certificate). b. Certificate in support of educational qualification. d. Registration Certificates of Delhi Medical Council/Delhi Dental council. e. Mark Sheets of MBBS/BDS Part I, II, & final year. g. Proof of prize/medal/publications/conference attended/extracurricular activities etc. WHAT IS ROLE OF NON- P G JUNIOR RESIDENTS IN A TEACHING MEDICAL COLLEGES , THAT WHEN THEY ARE OVER LOADED / CROWED WITH HOUSE SURGEONS/ INTERNS,. P G s – JR 1, JR 2 AND JR 3. I THINK IT IS NOTHING BUT CRIMINAL WASTE OF MANPOWER . ARE KIND OF MISS MANAGEMENT WITH MALAFIED INTENSIONS TO HELP THEMSELVES ( FACULTY MEMBERS) . BY LEAVING THE OPD s & WARD WORK TO THE J R , SO THAT THEY CAN RUN AWAY FROM THEIR RESPONSIBILITIES. SUCH THINGS ARE VERY COMMON IN MEDICAL COLLEGE TEACHING HOSPITALS – MOST THE LOCAL DOCTORS HAVING THEIR OWN PRIVATE PRACTICE DISAPPEARE SOON AFTER ATTENDANCE LEAVING OPD& WARDS WORK TO THE RECRUITS. I THINK IT WRONG TO APPOINT MBBS DEGREE HOLDERS IN TEACHING MEDICAL COLLEGES . IN A COUNTRY INDIA , THE BASIC DOCTORS PRESENCE MORE REQUIRED AT PRIMARY HEALTH CARE SYSTEM , WE ARE HARDLY PROVIDING /COVERING 25 % OF PRIMARY HEALTH CARE.